Now that’s the kind of portion control I can get on board with, especially when it comes to pizza or rice noodles. I went to the Asian supermarket on Saturday and picked up 12 bundles of rice noodles. Rice noodles are a pantry staple in my house. I literally can eat them for breakfast, lunch, and dinner. Super quick to prepare and the possibilities are endless. 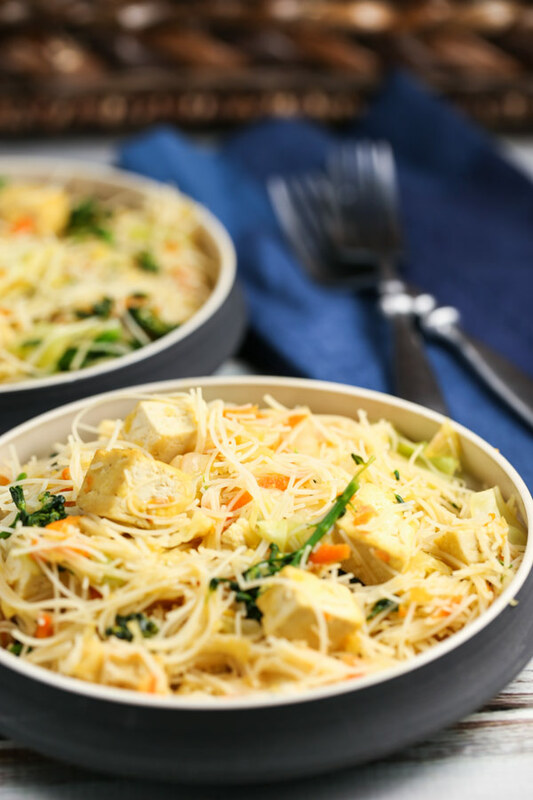 I’ve been ODing on Pancit lately, and I just have to share my favorite recipe with you. 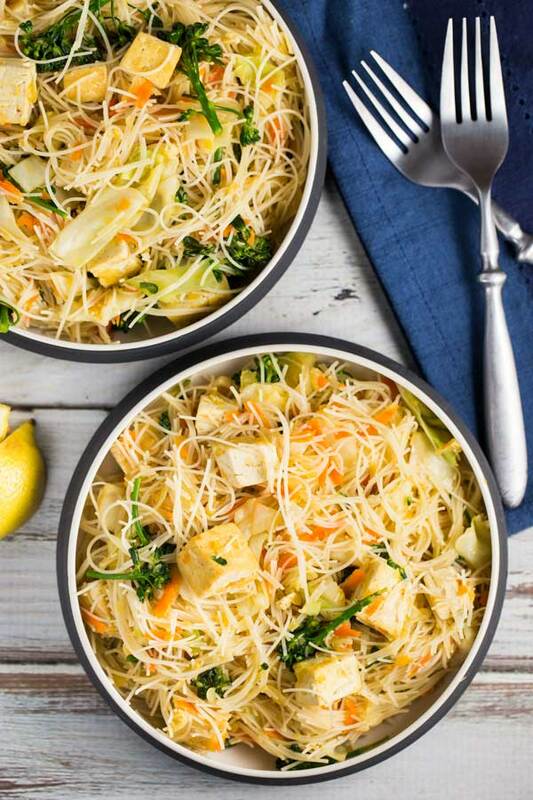 Pancit (pronounced PUN-SIT) is a Filipino dish that I’ve loved since I was in high school. When my older sister was at Cornell University, her dorm mate was Filipina and she used to cook the most amazing food. I’ve been a vegetarian since I was 12 years old, so her dorm mate made all of these traditional Filipino dishes for me with no meat. Did I mention she was super sweet?! Anyway, my absolute favorite has always been Pancit, but up until recently, I’d never tried to make it on my own. 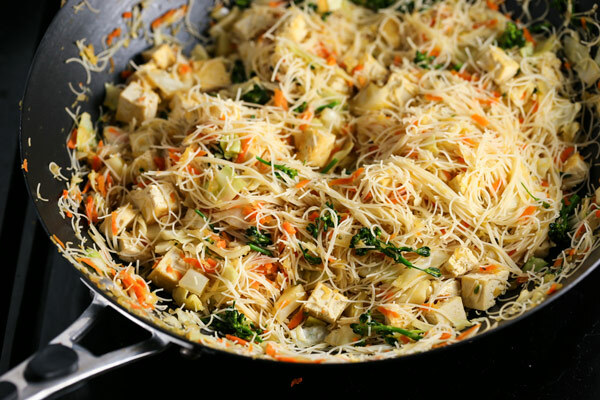 Then I found this recipe courtesy of the Veggie Chick, and it’s about as close as you can get to the Pancit I remember. You must try this!!! Place the rice noodles in a large bowl; cover with warm water and let sit. When the noodles are soft, after about 20 minutes, drain and set noodles aside. Heat 2 teaspoons sesame oil in a wok or large skillet over medium-high heat. Add the tofu and sauté until browned, about 8-10 minutes, stirring occasionally. Remove the tofu from the wok. Reduce heat to medium. Add the remaining 1 teaspoon of sesame oil to the wok. Sauté the onion and garlic for 2 minutes or until onion is translucent. Add the carrots, cabbage and broccoli. Stir fry until tender-crisp, about 5 minutes. Add the tamari, ginger, veggie bouillon cube, vegetable broth and sea salt. Stir until the bouillon cube is dissolved. Add the cooked tofu, rice noodles and stir to combine. Remove from heat. Serves 8. Best served immediately. Stays fresh in the fridge for 1 day. Recipe: the Veggie Chick for more plant-based cooking inspiration go here.